The International Space Station (ISS) has finally received a new docking adapter on Friday, which will enable the orbital outpost to welcome the first of a new generation of crew vehicles. The spacewalkers of EVA-36 installed the long-awaited International Docking Adapter (IDA) via efforts that got underway at 12:04 PM GMT and ended just under six hours later. The International Docking Adapter (IDA) is a piece of hardware designed to convert the US Segment’s old Shuttle-era docking ports to a new docking system, thus allowing them to accept the upcoming commercial crew vehicles which will all use the updated docking system design. The ISS uses two systems of attaching visiting vehicles – docking, and berthing. Both systems are designed for distinct, but differing purposes. 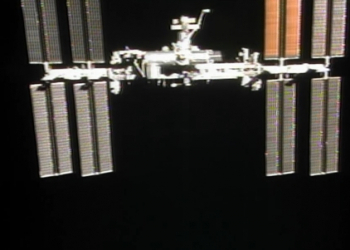 Docking ports allow an arriving vehicle’s docking system to impact a corresponding port on the ISS, whereupon capture is made, with all necessary power/data connections then being made automatically upon hard-dock. 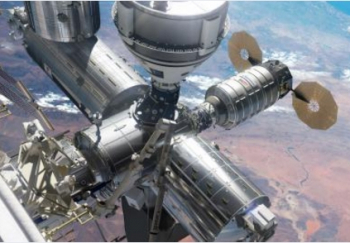 Berthing, however, is a process where a vehicle is flown to a point below the ISS, whereupon the vehicle is captured by the station’s robotic arm and positioned close to an ISS berthing port. Hooks then extend from the ISS side to pull the two vehicles together, with bolts then securing the two berthing rings in a tight seal. 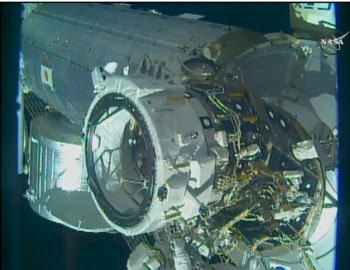 Power/data and ventilation connections are then made manually by the ISS crew. Docking is required to be used for crewed vehicles as it allows for rapid departure from the ISS in the event of an emergency, without first having to manually disconnect multiple cables and perform lengthy unberthing procedures. Berthing is generally used for cargo vehicles, as the station’s berthing ports have large 50-inch diameter hatchways, which allows for the transfer of large items to the ISS, and more efficient cargo operations. The US Segment of the ISS has two docking ports, called Pressurised Mating Adapters (PMAs), which are tunnels that convert US Segment Common Berthing Mechanism (CBM) berthing ports into Androgynous Peripheral Attachment System (APAS) docking ports. 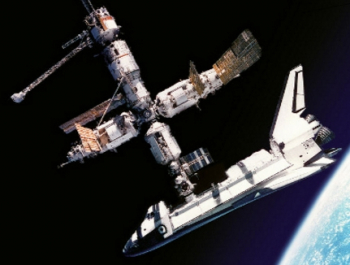 APAS was the docking system used by the now-retired Space Shuttles and is actually a Russian-designed system that NASA decided to adopt for ease of compatibility between the Shuttle and the Russian Mir space station, and joint Russia-NASA ISS. APAS consists of a capture ring which extends from the arriving vehicle, which impacts an APAS port on the ISS to provide initial capture of the two vehicles. The capture ring then retracts to pull the two docking collars together, whereupon the “hard mate” docking process is completed. However, APAS has a design disadvantage in that the system requires a large impact force to be applied in order for the capture ring on the arriving vehicle to latch onto the APAS port on the ISS. In the case of the Space Shuttles, this meant the Shuttles had to fire their thrusters immediately prior to capture ring impact. This is bad for the ISS structure, as vehicles of large masses impacting the ISS with such a force required for APAS capture reduces the lifetime of the station’s structure via the propagation of micro-cracking. 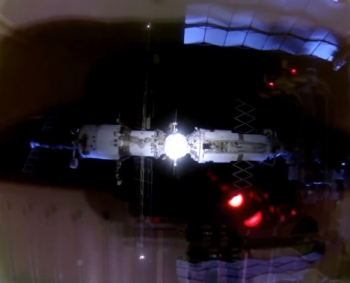 In addition, sensitive and delicate systems on the ISS can be damaged by the docking forces transmitted through the ISS structure – as an example, the station’s solar arrays could be seen moving in wave-like motion immediately following a Shuttle docking. As a result, for some time NASA has been developing so-called “low impact” docking systems, that do not require such large forces in order for their capture mechanisms to engage. The first such system was the Low Impact Docking System (LIDS), developed originally by NASA for the Crew Return Vehicle (CRV) program (click here for L2 CRV resource section) during the 1990s, but planned for use on the Orion Crew Exploration Vehicle under the now-canceled Constellation Program. Under the Constellation Program, Orion was planned to be the ISS’ crew vehicle to succeed the Space Shuttle, and thus the station would need a LIDS port in order to be able to receive Orion. LIDS featured an “active” capture ring with independent actuators to adjust the capture ring’s position relative to the corresponding port, thus requiring less precision from the spacecraft itself during approach, load-sensing instruments to damp out impact forces via the actuators, and electro-magnets to engage and bring the two ports together softly. It was originally planned to fly two APAS To LIDS Adapter System (ATLAS) docking adapters to the ISS, in order to convert the two APAS ports on the PMAs to the LIDS standard. 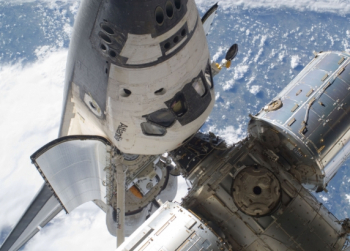 That plan then changed when NASA began looking at building two Common Docking Adapters (CDAs) that would have converted two CBM berthing ports into LIDS ports, thus eliminating the need for the APAS-equipped PMAs altogether. Consideration was even given to returning one of the PMAs to Earth on the final Shuttle flight. 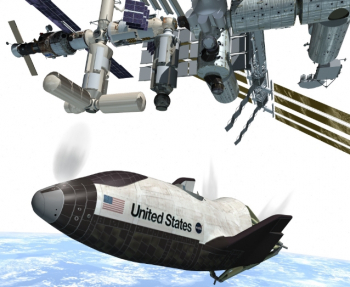 However, due to clearance issues between winged vehicles such as Sierra Nevada’s Dream Chaser and the ISS, it was decided to keep the tunnel-like PMAs, rather than the comparatively flat CDAs, as the PMAs provide a good amount of spacing between visiting vehicles and the ISS structure. In addition, in late 2010, the ISS international partners agreed a new International Docking System Standard (IDSS), which was a series of specifications rather than a specific docking system, designed to allow any vehicles meeting the standard to dock with each other regardless of their origin. NASA’s implementation of the IDSS was called the NASA Docking System (NDS), which was essentially LIDS with some minor modification to comply with the new standard, which became known as international LIDS (iLIDS). Thus, the plan then changed to building two ISS Docking Adapters (IDAs), to convert the APAS systems on the station’s two PMAs, to the new NDS, which was, at the time, iLIDS. However, the already long story then took another turn, as in 2012 NASA made the decision to abandon iLIDS for use in the NDS, and instead pursue a simpler Boeing-designed system known as the Soft Impact Mating Attenuation Concept (SIMAC), believed to be due to budgetary considerations. SIMAC traces its roots back to 2003 under the NASA Orbital Space Plane (OSP) project. It is essentially a “stripped down” version of LIDS, which retains the independent actuators for positional adjustment and load dissipation, but does not include other hardware such as the electromagnets. 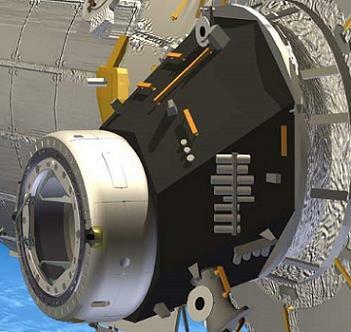 SIMAC will still comply with both the IDSS and NASA’s desire for low-impact dockings to preserve ISS structural life, but is a less complex, and therefore cheaper system than LIDS. As a result, the plan became to build the IDAs with the SIMAC system, in order to convert the APAS-equipped PMAs to the IDSS-compatible SIMAC-based NDS, which will be used on future commercial crew and exploration vehicles. In addition, consideration is also being given to docking future Cygnus vehicles via the IDAs as opposed to berthing them via the CBMs, as the Cygnus vehicles feature a smaller than normal CBM hatchway, and so the main benefit of berthing – as opposed to docking (a larger hatchway for cargo transfers) – is lost on the Cygnus. Therefore, it would save crew time to dock Cygnus as opposed to berthing it, while not negatively affecting cargo transfers and also freeing up the two cargo CBM ports for other vehicles, such as Dragons and HTVs. Two IDAs will be installed on the ISS, one for each of the station’s PMAs. They are ring-like structures with an APAS port on one end to connect to the PMAs, and a SIMAC port on the other end to connect to future crew vehicles. The IDAs do not feature a hatch, as the forward hatch of the existing PMAs will continue to be used as the hatch between the ISS and visiting vehicles. Two IDAs are desired over just one, as this will allow for one port to serve as a back-up to the other, and also allow for two commercial crew vehicles to be berthed to the ISS simultaneously in so-called “direct handovers”. 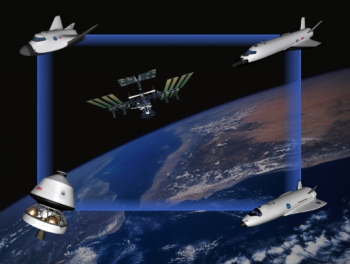 While “indirect handovers” were originally planned to be the operating model for commercial crew vehicles, whereby one crew vehicle leaves the ISS before its replacement arrives, it is now believed that direct handovers will be the preferred arrangement. This is because the direct handover model will eliminate the need for one US crew member to continue to fly on the Soyuz, which would be required in order to maintain a constant US presence on the ISS during indirect handover periods. IDA-2 will be attached to PMA-2 on the forward end of the Node 2 module, and IDA-3 will be attached to PMA-3 sometime in early 2018, once PMA-3 has been moved from its present stowage location on Node 3 to its usable location on the zenith side of Node 2. It was originally planned that IDA-1 would go on PMA-2 and IDA-2 would go on PMA-3. However, the loss of IDA-1 on the SpaceX CRS-7 mission in June 2015 aligned the IDA numbering with the PMA numbering. 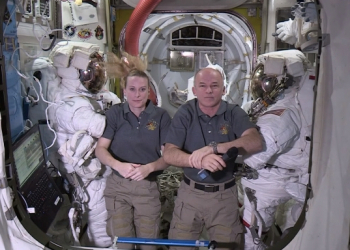 US EVA-36 is being performed by Jeff Williams as EV-1 in the suit with the red stripes, and Kate Rubins as EV-2 in the all-white suit. Williams is performing the fourth EVA of his career, while Rubins is performing her first. Japanese astronaut Takuya Onishi is the intra-vehicular crewmember for the EVA. The first order of business for Williams and Rubins upon leaving the Quest airlock was to translate out to PMA-2 on the forward end of Node 2, with Rubins retrieving an Articulating Portable Foot Restraint (APFR) from External Stowage Platform-2 (ESP-2) and Jeff retrieving an APFR from the top of the Columbus module along the way. The pair will then set up their APFRs on PMA-2 and begin their first task – tethering IDA-2 to PMA-2. IDA-2 was pre-positioned just in front of its installation site on the forward side of PMA-2 by the ground-controlled Special Purpose Dexterous Manipulator (SPDM) “Dextre” robotic hand, which extracted IDA-2 from the Trunk of the Dragon CRS-9 spacecraft on which it was launched last month. The SPDM positioned IDA-2 over PMA-2’s APAS docking collar, with alignment guides on both the PMA and IDA aiding the process. However, the IDA was not physically attached to the PMA at this point. The SPDM had to therefore “hand-off” the IDA to the two spacewalkers once the IDA was tethered to PMA-2, and then release the IDA, which marked the first ever hand-off from the SPDM to a spacewalker. 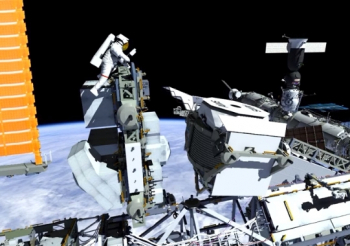 The tether straps were then tightly cinched in order to bring IDA-2 and PMA-2 together, and the spacewalking crew began connecting cables that were pre-positioned over previous EVAs to the IDA. These included three heater power, sensor power, and hook drive power cables. Once these cables were connected, Onishi headed to the internal IDA Control Panel inside Node 2, and commanded IDA-2 to latch, which will attach it to PMA-2’s APAS docking system. This completed the physical attachment of IDA-2 to PMA-2, and marked the first time anything has been attached to PMA-2 since Space Shuttle Atlantis departed the ISS at the conclusion of the final Shuttle mission, STS-135, in July 2011. 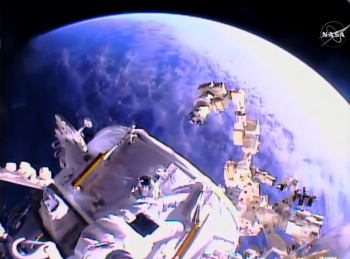 The next task for the spacewalkers was to install a cover over a reflector on PMA-2. These reflective targets allow the guidance systems of approaching spacecraft to sense the ISS. However, IDA-2 includes its own new reflectors, and so the old sensors on PMA-2 were covered to prevent any interference with future dockings. A cable that provided power to the hooks which latched IDA-2 onto PMA-2 was then removed, as those hooks will only be required during the attachment process of IDA-2 onto PMA-2. Said cable was instead connected to another port on IDA-2 in order to provide power to the latches which will attach future crew vehicles to IDA-2. The grapple fixture that the SPDM used to grasp IDA-2 was then covered, in addition to another unneeded reflector on PMA-2. 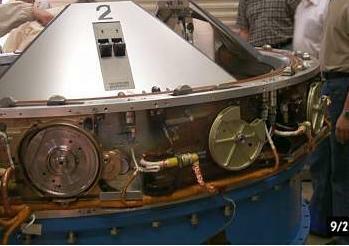 A cover that was placed over the front of IDA-2 during launch was removed, exposing IDA-2’s SIMAC docking collar. Two reflectors were then installed onto IDA-2, and a visiting vehicle power cable was mated to IDA-2. At this point, IDA-2 was fully installed and the ISS is now finally ready to accept commercial crew vehicles. The spacewalkers then cleaned up the worksite and returned their APFRs to their previous stowage locations. 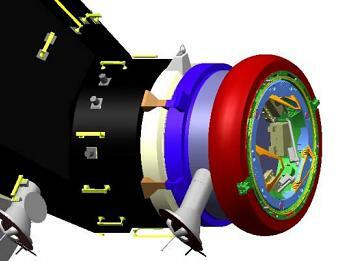 A few extra tasks unrelated to IDA-2 were then completed – which for Rubins was involved with routing a cable from the Destiny Laboratory to Node 2 in prep for the future installation of IDA-3. Williams meanwhile headed to the infamous “rats nest” cabling area between the Z1 Truss, S0 Truss, Node 1 and Destiny modules, where he performed some cable routing work in prep for a future EVA. 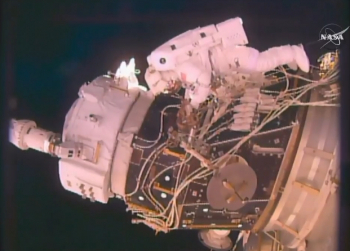 At this point, both spacewalkers headed back to the airlock to conclude the EVA. Although time permitted, the get-ahead tasks – in the form of tying down some brake handles on the port Crew Equipment Translation Aid (CETA) cart, and photographing the starboard side of the Alpha Magnetic Spectrometer-02 (AMS-02) which is not visible from inside the ISS – were approved. However, communication issues with Jeff Williams resulted in the Flight Director calling for a nominal end to what was a hugely successful spacewalk.